NYC has an interesting plaza that functions as a transit hub (including commuter rail and local and express buses), a bus layover area (it's the end of one of the lines), a public gathering space (especially for teens after school), and a vendor destination (including produce, ethnic foods, crafts etc.). Although the street bisecting the plaza appears to be a bus-only street, it is actually a mapped street that a new retail/office development along the plaza will use as their loading area. DOT is also looking to locate a test BRT loading area along Fordham Road. Does anyone know of any good examples of a plaza that also functions as a bus depot? Or one that successfully combines some of the uses listed? I've only passed Fordham place in a car, but it definitely appeared to have a positive feel to it, probably because alot of it is new along with several other new buildings around it. I think a lot of cities have problems with tossing bus terminals off to the side, so its nice when new stations and waiting areas are built out in the open and integrated with the urban fabric. Currently, the city of Detroit's "bus plaza" is Capitol Park. It won't be for long as a new a terminal is being built, but I always thought it was a nice urban space. The only problem is this area hasn't seen much investment like the rest of downtown, so the businesses tend to be on the lower end, and there isn't a whole lot of lighting. It's definitely one of the more shadier areas of downtown, although recently many renovations have started. The biggest problem is that a lot of homeless congregate in that area because it's the only location they can loiter without getting too much flack from the police since it is an area to wait and stand around. Oh right, that is a good space. I used to work across the street from there. There are lots of waiting areas and a good number of trees. Loitering was definitely a problem, although I never felt unsafe there. The triangular shape is good because it provides for so much street access, but the streets aren't very wide, so the scale of the place is nice. I don't think it has the added complication of being a bus layover area. It should still be a nice space without the bus stops, although it could feel a little remote unless more active businesses move into the area. On a side note, I remember when the building with the circular windows was bright blue - it always reminded me of a tugboat. 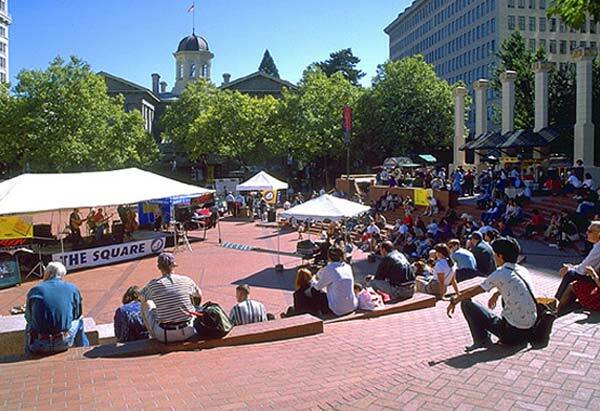 One of the best examples of this is Portland's Pioneer Courthouse Square. The square's modern design incorporates public art, flowers, trees, walls and ample stairs that do double-duty as seating areas. It is the scene of frequent events, enhanced by a coffee shop and food vendors, and also serves as a hub for buses and light rail. That's interesting. At Fordham Plaza it's more an issue of congestion all around, except later in the evening, although that's changing. It's a bus layover area, as well as a major bus stop and train station (Fordham Station is the third busiest Metro-North station in the system). Pedestrian congestion is a particular problem on the north side of the plaza where most of the bus stops are located. The vendor buildings help activate the plaza, but also divide the north area from the south. There really isn't enough room for all those double-length (articulated) buses, especially with the traffic along Fordham Road. On top of that, congestion could be exasperated by the new office building when it starts using the street that runs through the plaza as its loading area. The buses already divide areas of the plaza when they park along the road. The other issue is the visual termination of the plaza when you enter from Fordham Road is essentially a view over the Metro-North tracks. And signage is a problem as well - many people don't realize that there is an entrance to the train station on the plaza (the main entrance is across the street on the north side of Fordham Road), and some of the bus stops in the area aren't clearly marked. The Bronx's Little Italy is just a few blocks away, and the Botanical Garden and Zoo are in the area, but you'd never know it because there isn't any directional signage.